My Seared Scallops recipe look so fancy, but they are one of the easiest things EVER to make. The secret is to just leave them alone. That’s it! Well, there’s a little more to it than that. 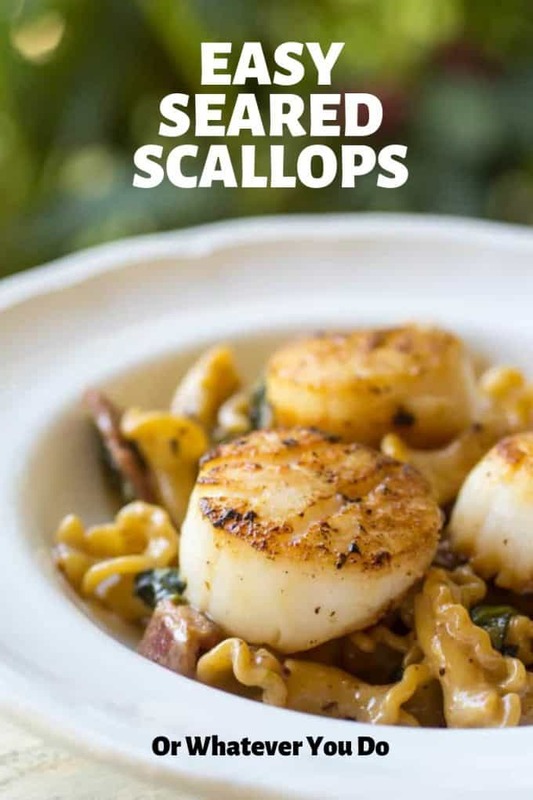 Read on to find out how to make perfect and EASY seared scallops. This easy seared sea scallops recipe uses fresh sea scallops that are quickly pan seared and served with a bacon cream sauce. It is rich and decadent and full of the sweet, seafood flavor that scallops are famous for. I am SUCH a huge seafood fan. Like – crazy big. I could eat seafood many times a week, sushi especially, and not get tired of it. You can see that in my seafood bisque, easy shrimp scampi pasta, crispy battered halibut, garlic steamed clams, Dungeness crab stuffed shells, blackened shrimp pasta, and my homemade crab cakes. Of all the seafood I love, and the list is LONG – a really big, well-cooked sea scallop is totally near the top. 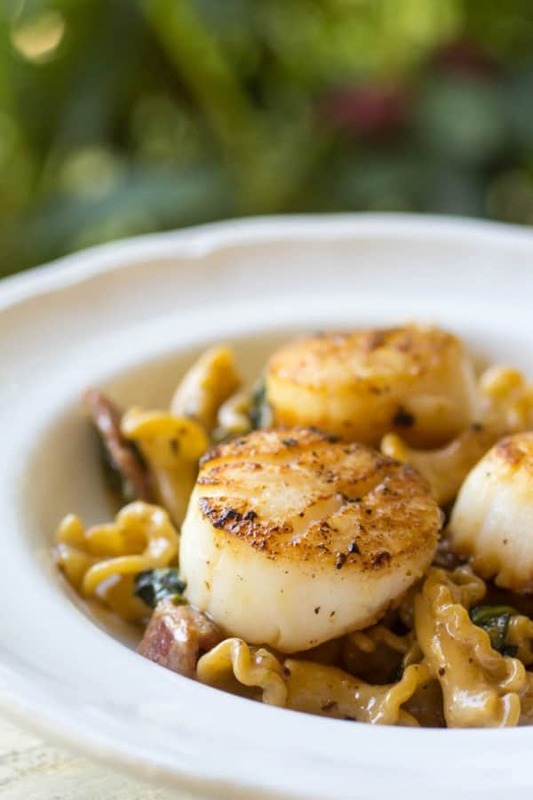 These pan seared scallops are an excellent addition to your summer meal rotation. 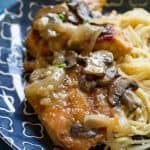 I don’t know about you, but with warm summer weather, I’m looking for EASY light meals that fill up my family and taste great. These pan seared scallops in garlic butter are exactly that! Scallops are the perfect summer choice because they’re high in protein and low in fat. 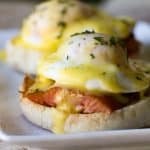 Not only that, but they’re incredibly easy to make, and the rich, savory flavor is super versatile. 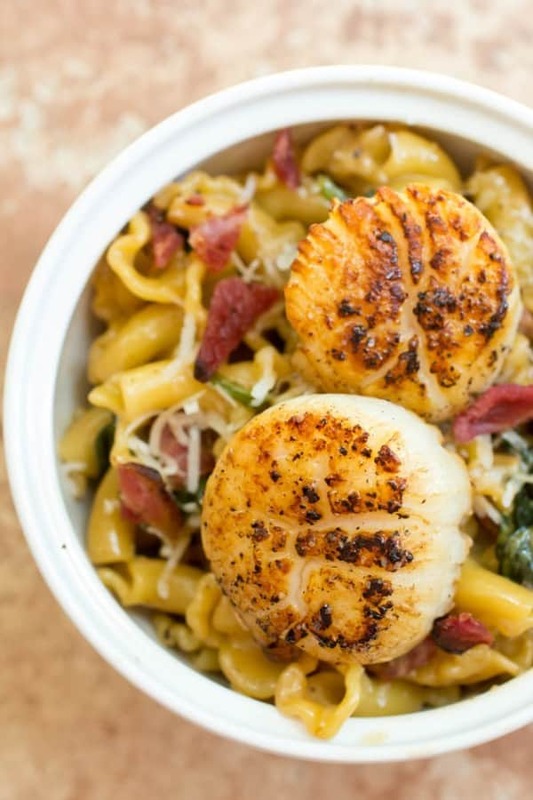 These delicious scallops pair well with everything from pasta to asparagus. 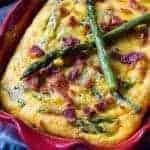 Need a good asparagus recipe? 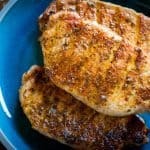 Try it with my Perfect Grilled Asparagus! Even better, throw together my Fettucini with Roasted Garlic Cream Sauce for a complete meal in no time! Now you’ll have time to sit outside after dinner and enjoy all the extra daylight! Scallops are in the bivalve family and live in saltwater all around the world. Some species, bay scallops, thrive in bays and estuaries, while sea scallops are found deep in the ocean. Scallops do not live in freshwater, only saltwater. Most are free-floating, but some species live by attaching themselves to a rock or other hard surface. The free-floating varieties can even propel themselves through the water by clapping the two halves of their shells together! Scallops can be found living in sand, mud, rubble, kelp, and seagrass, as well as on rocks. The shells of the scallop are called as the valves, hence the name “bivalve”. Bay scallops are small – about a half an inch on average. They’re more tender than sea scallops, with a more delicate flavor. In the United States, most bay scallops are harvested from the east coast. Sea scallops, on the other hand, are large. They’re usually around two inches across, but can grow as large as 8 inches! Sea scallops are harvested from much deeper waters and further out to sea. 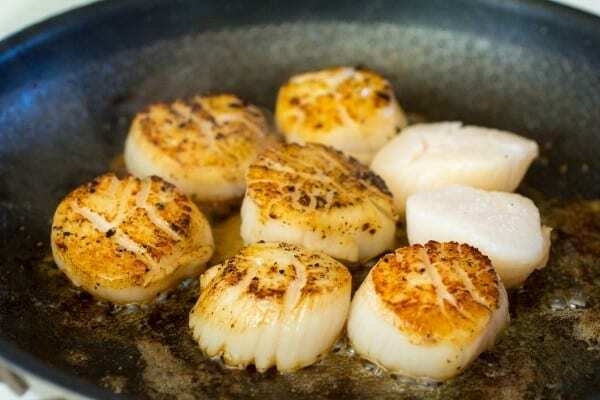 Scallops cook quickly, only 1 ½ – 2 minutes per side. Start with DRY scallops. Pat them dry with paper towels, and get the surfaces as dry as you can. 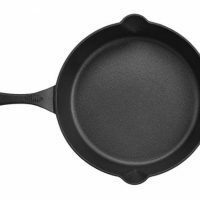 Use a well-seasoned pan, and DON’T TOUCH THEM until they are ready to flip. That’s going to form that awesome crust that is so characteristic of a great scallop. Scallops are done when they’re opaque and slightly browned. Don’t forget the salt. 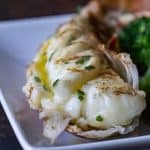 It really brings out the flavor of the scallop and makes it shine! They can be overdone, so watch them closely. Remove scallops from heat just before they’re fully done to avoid overcooking. Uncooked scallops can be kept in the fridge for up to two days. Another great thing about making scallops is how easy they are to freeze and reheat for later! Whether you need to freeze them from fresh or save your meal for another day, the freezer is your friend. Fresh, raw scallops should be refrigerated and used within two days, but if you can’t get to them in that time, toss them in your freezer. Just wrap them in plastic and put them in the back of your freezer, where it stays the coldest. They’ll keep the best flavor for 3-6 months. 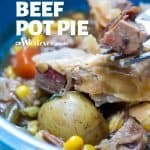 To reheat them, either let them rest in the fridge for a day or put them in a bowl of water to defrost. Before putting them in water, make sure they are in a sealed plastic bag, so they don’t touch the water directly. Cooked scallops will keep 3-4 days in the fridge, or in an airtight container up to 6 months in the back of the freezer. 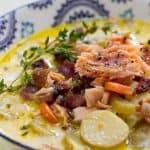 What kind of bacon should I use in the bacon cream sauce? I actually used cottage bacon which comes from the shoulder of the pig, and is much leaner than typical bacon. I’d never tried it before, and it was wonderful. For my breakfasts of bacon and eggs I still prefer the regular style bacon, but for dishes like this or anything you need crumbled or chopped bacon and want it to stay crisp? That cottage bacon was perfect. 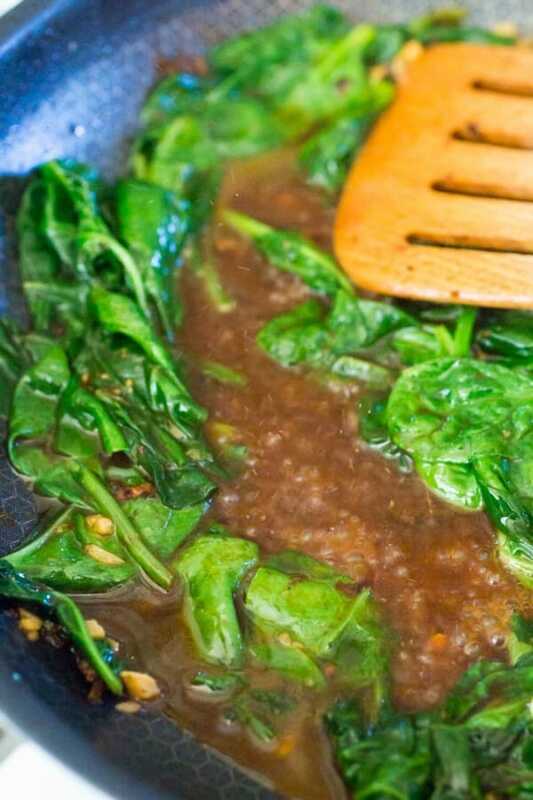 You can use either kind in this sauce and it won’t negatively impact the end result. I cooked the bacon first and then used the leftover grease to sear my scallops. The cottage bacon was so lean that I needed to add a little extra oil, but not much. All that stuff on the bottom of the pan? You must leave it there. Cook your scallops over medium heat to make sure the brown bits don’t burn because those are ALL flavor. ALL of that color is from the bottom of the pan from cooking the bacon and scallops. Yum. So add your spinach to the pan right after you remove the scallops, and then toss in your wine. Add a few tablespoons of butter next. Once it melts, pour in your cream. Add in the bacon, and then let that mixture simmer, stirring frequently, until it reduced and tightens up a bit. Then toss in your noodles. Stir those around, and reduce the heat to low. Taste, and if necessary – add a little salt. Use a light hand though! Depending on how salty your bacon is, this might not need any! I highly suggest unsalted butter as well to account for this. 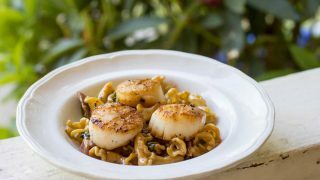 Serve the pasta with the scallops, and you have a rich, flavorful meal that is nice enough to serve your guests, but easy enough to feel confident preparing. What Else Can I Make With Scallops? Now that you’ve tried pan-fried garlic scallops in cast iron, try these recipes next! 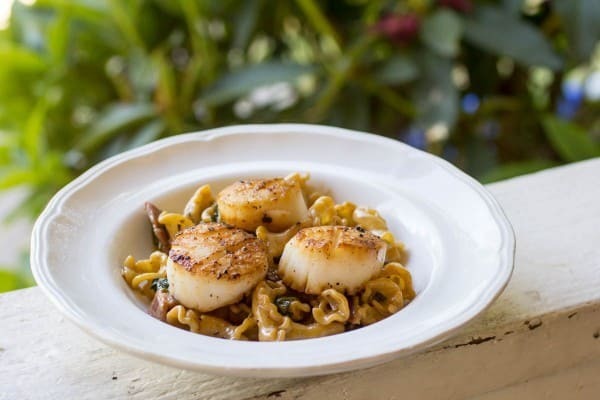 Delicious seared sea scallops with a rich bacon cream sauce is a delicious meal to serve any day of the week. 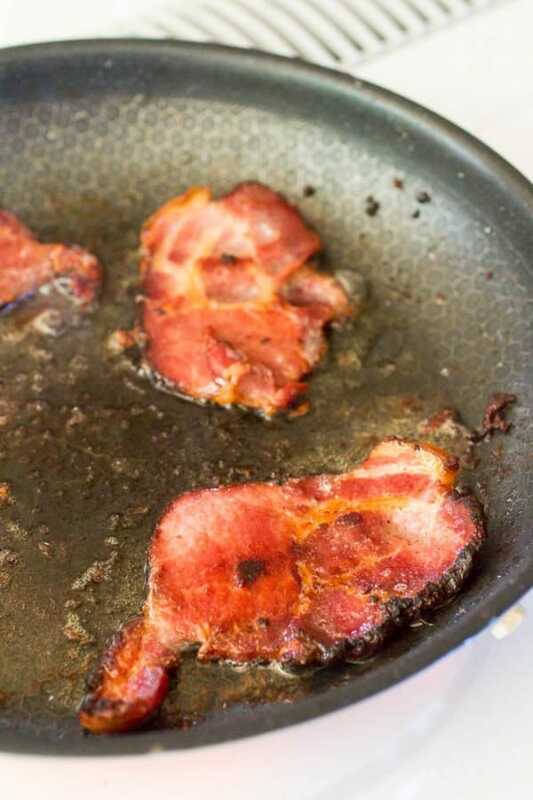 Cook bacon until crisp in a well-seasoned cast iron or non-stick pan. Remove bacon from the pan, give it a rough chop, and set aside. 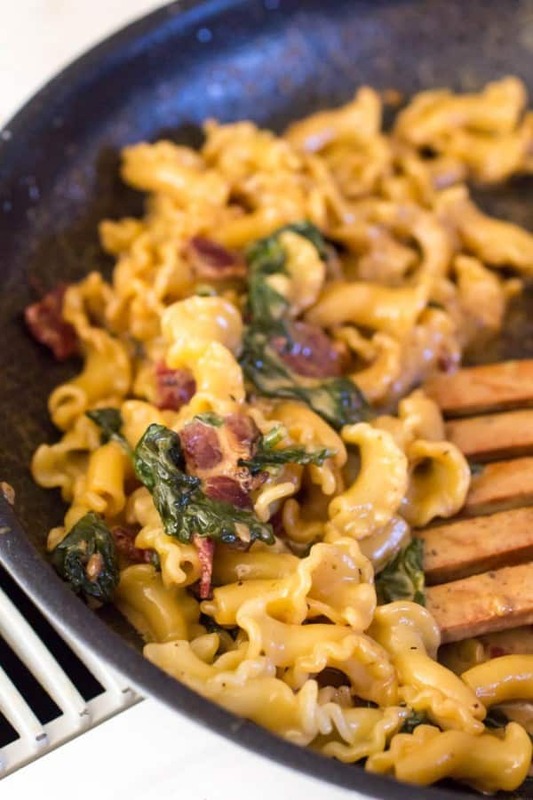 If there is excess grease in the pan from the bacon, remove it and leave only about 2 tablespoons, or enough to coat the bottom of your pan liberally. If there isn't much grease left from the bacon, add in enough oil to liberally coat the pan. Seeing a pattern here? Place the scallops in the pan, and cook over medium heat for 2-3 minutes per side. DON'T MOVE THE SCALLOPS AROUND TOO MUCH! You want them to develop a bit of a crust, and that doesn't happen if you mess with them. Flip once, brown the other side, and the remove from the pan. 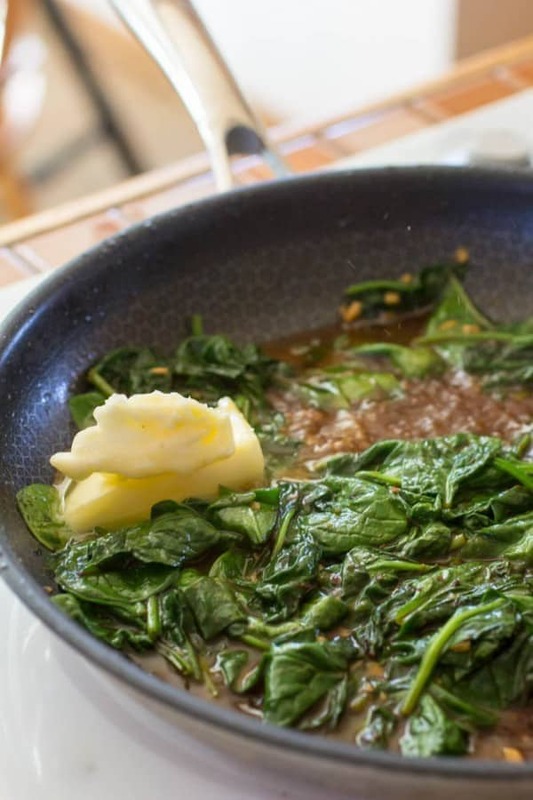 Toss the baby spinach and garlic in the pan, give it a couple stirs, and then add in the white wine and butter. After the butter melts, stir in the cream and bacon and let the sauce simmer over low(ish) heat until it is slightly thickened and has tightened up a bit. 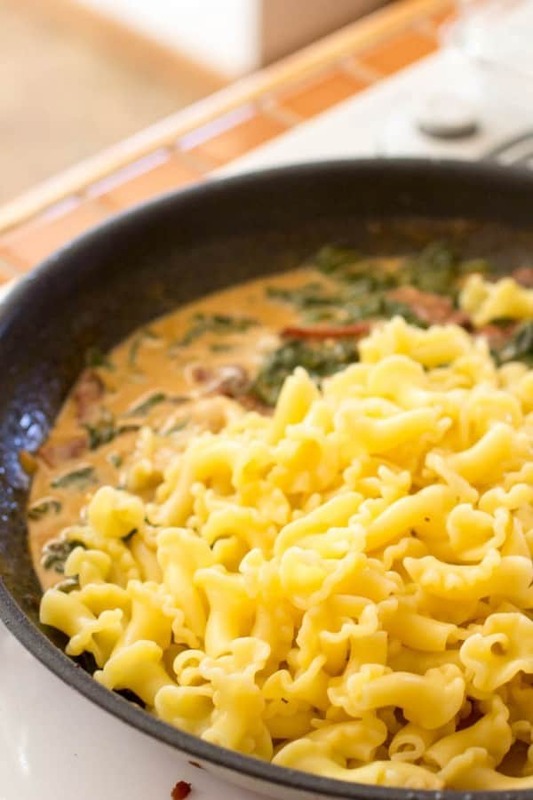 Mix in the cooked pasta, and toss to coat. Taste, and add salt if needed. Serve with the scallops, and top with freshly grated Parmigiano-Reggiano. Made this tonight and it was ok. Cut back to half on the wine and it still didn’t thicken. Flavor was bland, kind of like we were missing something. I think next time I would add mushrooms and perhaps diced tomato or sun dried tomatoe strips for an additional layer of flavor. 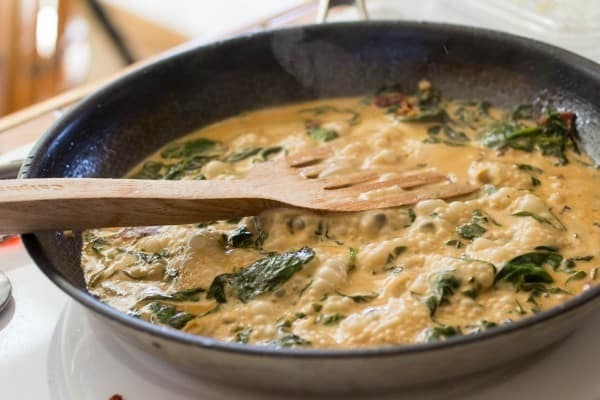 Would also switch the amounts of white wine and heavy cream. Much less wine would give the sauce a thicker consistency. Used Sauvignon Blanc and might try a Chardonnay as a sweeter flavor might have helped. Would try it again with modifications. Thanks for the feedback, Tina! I appreciate it! 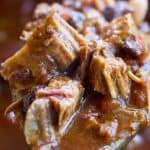 The sauce takes a bit to thicken, and it will depend on what temp your stove is, and how strong you are simmering. I think mushrooms would be a great addition to this!